Christmas is less than 93 days away but some are already thinking of it either by decorations or shopping. One of my LNS - Mom & Me Forever has stitchers stitch the ornaments from the current JCS ornament issue for display in the shop. 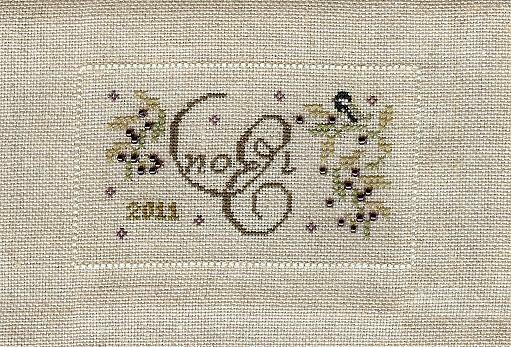 I got to do Jeanette Douglas' Noel and I loved every minute of it...it has both over 2 and over 1. While waiting for my LNS to get in the colors for BBD Casting a spell that everyone bought her out of last weekend, LOL, I decided to do up the new LK that I got. Okay, I got it a year after it came out but it's new to me. :) So here is Lizzie Kate's Flora McSample Boo. 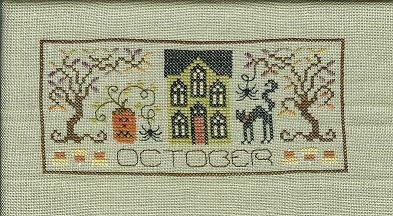 I finished up Drawn Thread's October calendar cover....this is a weird piece of fabric....it IS 32 ct.(because I counted it several times) but it just seems so large. 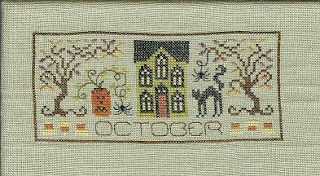 I thought it was because I just finished the big sampler on 40 ct. but October even stitched up bigger than the rest in the series. 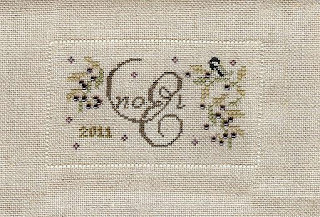 I'm going to go and count the size of the border on some of the others to see if they just made it wider. BTW, is anyone else having trouble with Photobucket today? I can't get the pages to load right and it won't give me the final upload button to put in my picture. If you ever have the opportunity to go to Celebrations at any location, I would recommend it. I took one class and thoroughly enjoyed it once I got there late because I thought it was the next morning. ;(. I also ended up adding the Friday night event which was very nice also. Next time I will take a round robin class to experience more....also I did quite nicely thank you on the stashing front and besides this was my retreat for the year....so instead of hotel & meals just stash & a class.....I will tell you my first purchase was me making a beeline to Inspired Needle to choose a pair of Dovos which I had been wanting but wanted to fondle before purchase...good thing...3 1/2" wouldn't have worked for me. Got a few charts there too...then on to Shakespeare Peddler...WOW...love this room/shop...I got 2 patterns, 2-1/4 yds. of 40 ct fabric(more than enough for the patterns) and 10 'ka-ching' silks for the two charts I got from Keslyn's room. I spent more time at Celebrations actually stitching though....spending the money didn't take that long so I planted myself in the nice seating area in the lobby with some friends and stitched the afternoon away till that night's dinner. So alas, Just a few minutes ago I put the last stitches in on My Big Toe-Morning prayer. I intend to frame this right up and make it a point to read it regularly to keep me on track. This morning I am off to Celebrations. Yesterday I took the class by Susan Greening Davis-Gadget Gal and it was super. I get to preview the shopping area before it opens(with another 100 people of course)then it's shop till I drop or find a good place to sit and stitch and watch for those I know who said they were coming. Will fill you all in later. I have a few ort ports available for sale. They are $10ea. + actual postage. Sorry for the gap in posts....I have a new finish but it's a model for a designer so I can't show it yet. I'm working on MBT Morning Prayer and should have a pic of it soon. I will also be posting ort ports for sale this week sometime as well as posting about Celebrations which is here in my area this weekend. Hope some of my readers are ones coming that I could meet. I will have a nametag on. 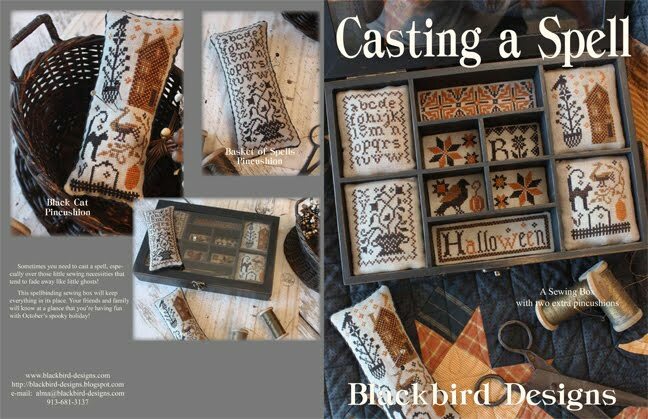 So till later this week, hope you all have some wonderful stitching time and have a great week.